Please join us this Friday for a presentation by the museum’s Davidson Family Fellow, Aaron Carico, PhD candidate in American Studies at Yale University, as he discusses the painting Attention Company! by William Harnett. Many thanks to Jim Hargrove and readers of the Star-Telegram for choosing our "front porch" as one of the most inspiring places to stand in Fort Worth. I've always thought that one of the fringe benefits of my job was walking out of the front door on Thursday evening (we're open until 8 p.m.) and viewing the lights of downtown. Come see some beautiful landscapes inside then step out for a wonderful look at an inspirational view. Our youngest patrons recently worked on a community art project using found objects and assembling them in a style evoking a sculpture in our permanent collection by Louise Nevelson. They constructed sculptures inside of small boxes, then placed their small box inside a larger assemblage of black boxes. How lucky we are to have such talented artists at our Storytime programs! Only two more Storytime at the Carter programs to go for the summer! Bring your pre-schoolers and keep cool while making art and hearing some of your favorite stories. Storytime at the Carter is made possible by the Junior League of Fort Worth and Target. Psychologist Miriam Tatzel surveyed 329 shoppers and discovered that folks who put more importance on the shopping experience are happier than folks who concentrate on the “value” of the goods purchased. Also, being with other people increased the enjoyment of the experience. So spend some time instead of money with your friends and family at the Carter and experience great art. Researchers from Italy’s University of Bari have announced that looking at art may help ease pain. Twelve healthy subjects were inflicted with a strong stinging pain while looking at works of art that they had previously seen and given a rating of beautiful, neutral, or ugly. Perceived pain was reported to be one-third less intense when subjects looked at art rated as beautiful. On the other hand, the pain was reported as more intense when the subjects rated the art they were looking at as ugly. Coming to the Carter may ease your physical pain and it won’t cause pain to your wallet either. All exhibitions are free all the time! On June 6, 1944, Amon Carter handed over the deed to the land that formed the Big Bend National Park. Mr. Carter and his paper, the Fort Worth Star-Telegram, spearheaded the drive to raise funds from the people of Texas to purchase the land. Take the time to visit this incredible place. Be sure to visit the Basin and see Amon Carter Peak. Looking for a great walking workout? Consider taking a tour of the public art in the Cultural District. You can find a handy self-guided tour on our Web site that will inspire you as well as help you to get to your workout target zone. Through the magic of videoconferencing technology we continue to hold discussions with educators across the country about how to creatively use the Carter’s artworks in their classrooms long after an exhibition has been removed from the galleries. This week the 2007 photography exhibition With New Eyes: Exploration and the American West inspired a professional development broadcast that served teachers from Brock to Cotulla. This program explored photographs of four nineteenth-century U.S. government surveys, and while the missions of these surveys and the resulting images are fascinating, what really intrigues me is that the images were even made in the first place. 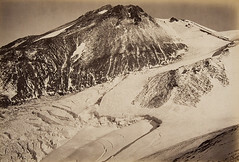 Most of the expedition photographers created albumen silver prints (like Carleton Watkins’ Commencement of the Whitney Glacier, Summit of Mt. Shasta above) using the wet plate collodion process. The glass plates had to be prepared, the plate exposed, and the image developed---all while the plate was still wet. Watch a contemporary photographer demonstrate the process, and think about how challenging it would have been for Watkins to create his Mt. Shasta image. In fact, Watkins---who was already a veteran of expeditions through California and acclaimed for his mammoth-plate photographs of Yosemite by the time he joined Clarence King’s U.S. Geological Survey of the Fortieth Parallel---prepared a special enclosed wagon as a mobile darkroom to augment his technical facility during the arduous trek. If the process alone wasn’t difficult enough, imagine for a moment carrying around all of your glass plate negatives and all of your photographic supplies over rough, rocky terrain. Sometimes you can even see evidence of the process in the finished prints. Look closely at Watkins’ The Shasta Buttes below. 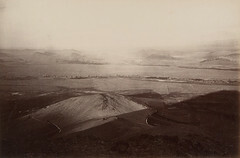 The hazy gap in the center of the photograph is the product of an uneven application of collodion. The next time you take a picture on your digital camera or cell phone, tip your hat to those nineteenth-century photographers who needed more than a split second to compose their awe-inspiring views! Congratulations to Alfred Walker, facilities manager, on his thirty years at the Carter. By the way, Alfred is not the senior staff member. That honor belongs to Rynda Lemke, staff photographer extraordinaire for 31 years. This place gives me such peace that my heart is already slowing down from the long run to this place. The bluebonnet’s color is so vivid that they seem purple yet they are blue”¦.